Here it is! 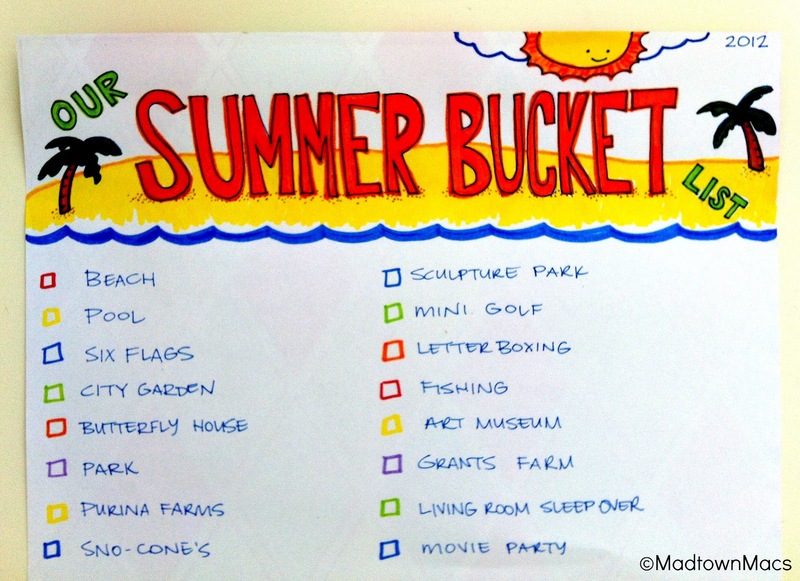 Our Summer Bucket List! I was happy with how much we were able to get done on last year's list. It definitely served its purpose and got us up and moving and doing things that we normally don't do around this city. I just read a post over at Nesting Place, where she talks about how many summers she has left until her three boys leave for college. (Go over and read it - you'll be glad you did!) She's figured that she has a total of 18 summers left before her youngest leaves for college and is determined to make the most of each of them. Her perspective got me thinking and I'm determined to do the same. It really hit home yesterday when I told the kids we were going on a picnic and Vance said, with a clenched fist, "Yessss! Awesome!" and I laughed to myself because he got so excited about a picnic. Ladies and Gentlemen, I bet a can count on one hand how many years I have left until picnics, bubbles, popsicles on hot days, and simple things like that loose their luster. Truth is, I'm going to miss it when that happens. So! Here's to having fun and making everyday count! The kids had lots of ideas, so looks like we're going to be busy! I left room just in case we want to add anything too. 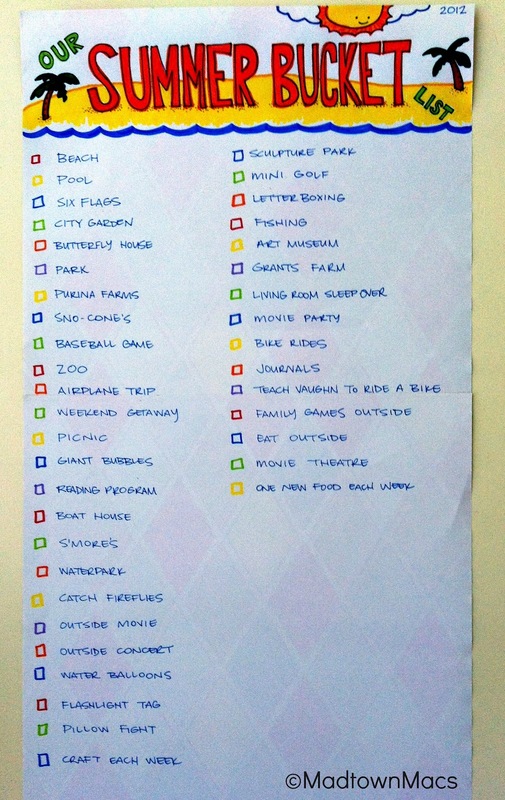 Are you like me and need a list to keep you going through the summer? How does your family do Summer Vacation? I'd love to know! We always plan a few camping trips. The kids look forward to the S'mores. Just came across your blog while jumping around on internet. 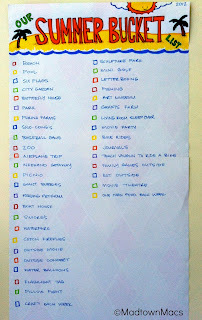 By reading your bucket list- I'm guessing your close to us! We are in Webster groves. But- today we are in our rental car driving into San Diego. My boys are 13 and 15- talk about counting down summers...... Makes me wanna cry. I finally pulled the trigger on this California vacation for that very reason. In the last five days we've flown to San Francisco, seen Alcatraz, golden gate bridge, sausilito, giant redwoods, Haight-ashbury, the houses from "Full House", driven down the coast and seen kite boarders, bunches of seals napping on beach, the most beautiful ocean views, surf town-Santa Cruz, spent nights in Carmel and Santa Barbara. Enjoyed Santa Monica pier, Hollywood craziness- movie star handprints, toured WB Studios lot. We are now arriving at the Del Coronado for the weekend. We are exhausted- but have enough pictures to hopefully get me through my impending "empty nest" days!! 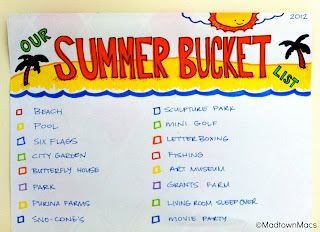 Do your bucket list now- the memories are worth braving that st. Louis heat! Thanks for stopping by Tyra! We are close to each other, neighbor! Sounds like you're doing it all in Cali - you'll need a vacation to recover from vacation! Cheers to getting out and making memories!